NASA's Mars Exploration Rover Opportunity sitting inside an alcove called "Duck Bay" in the western portion of Victoria Crater. A motorglitch has resurfaced aboard NASA?s Mars rover Opportunity and may hinder someof the long-lived robot?s ability to wield its mechanical arm. The troublesomemotor powers the sideways movement of the shoulder joint on Opportunity?sinstrument-tipped robotic arm and has suffered from intermittentstalling problems since 2005. But theglitch appeared to have worsened last week, when the motor stalled much earlierthan in the past. Opportunity?s robotic arm is currently deployed and NASAengineers are determining whether an earlier fix can still be used to move themotor as desired. ?Motion ofthe stall-prone shoulder motor is necessary to unstow the arm,? missionmanagers said in a statement. ?So if the motor were to become unusable with thearm in the stowed position, the arm could not be deployed again.? The motorstalled on April 14 just after it was unberthed from its stowage hook, mission managersadded. If themotor failed outright while the arm was extended, Opportunity could stillconduct science by compensating with other arm motors and some fancy wheelwork,NASA officials said. "Evenunder the worst-case scenario for this motor, Opportunity still has thecapability to do some contact science with the arm," said John Callas,project manager for Opportunityand its robotic twin Spirit at NASA?s Jet Propulsion Laboratory inPasadena, Calif. "The vehicle has quite a bit of versatility to continuethe high-priority investigations in Victoria Crater and back out on theMeridiani plains after exiting the crater." Like Spirit,Opportunity wields a single, 3-foot (1-meter) long roboticarm tipped with a turret containing four instruments to analyze the martiansurface. The 13-pound (6-kg) arm contains five motors that provide sideways andvertical shoulder motion, as well as elbow and wrist movement. The balkyshoulder motor on Opportunity?s arm began acting up in 2005, when it firststalled due to suspected degraded wiring. By applyinghigher voltages than normal to the motor, rover engineers were able to overcomethe stall and move the shoulder sideways. Since then, rover handlers have leftOpportunity?s robotic arm deployed overnight - rather than folded up at thefront of the rover - after each day?s drive to ensure it can be used forscience even if the motor fails permanently. Engineersare studying whether the same fix can be used for the renewed stall issue, andare holding off on moving Opportunity out of a sandy patch of ground insideVictoria Crater - a 2,625-foot (800-meter) wide depression on the martianplains of Meridiani Planum. "We'llhold off backing out of the sand until after we've completed the diagnostictests on the motor," Callas said. "The rover is stable and safe inits current situation, and not under any urgency. So we will take the time toact cautiously." 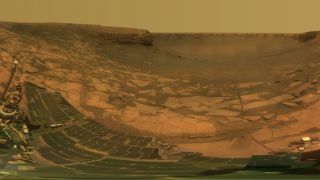 The Spiritand Opportunity rovers havebeen exploring Mars since their January 2004 landing. The hardy rovers aremore than four years into what was initially planned to be a 90-day mission.